Hahaha. Tom, i think i am the only one with the correct prediction.2-2 draw. Best game I watched all world cup and I only saw the second half!! Tom probably mutari was giving hint that he wants to change shorts with a german player... remeber that croatia game? US can clinch tomorrow. C'mon boys. I believe that we will win! Tom, which is better? Netherlands-Australia or Germany-Ghana? No bicycle kick yet Bob. 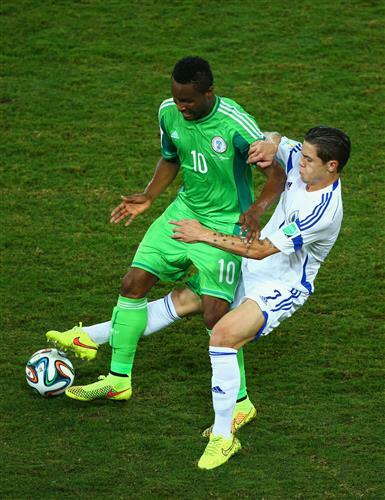 John Obi Mikel and Muhamed Besic battle for the ball. Edin Dzeko is almost in again, but his control is a little off. @Drew: they do, but he's on the bench right now (Moses). Bob,we are yet to see the hand of god! I wonder if club managers watch the WC and think, "Hmm, maybe I should play that player more often." FBT, I imagine world Cup performances are the exception to their usual efforts. Ogenyi Onazi blasts a speculative effort wide. Why doesn't Dzeko start for City again? Players are used differently too. Almost a party foul from Vincent Enyeama! Dzeko misses too many chances, but a useful backup for City like he proved last season. Miralem Pjanic hits a shot from 30 yards, and Vincent Enyeama is in all kinds of trouble as he spills the shot - but the ball rolls out to a defender. There has been some very questionable officiating the last few days. Costa Rica and Italy comes to mind, very one sided, Costa Rica really didn't get anything from the officials, eveon obvious penalties, while Italy got free kicks where there shouldn't have been.